I was very excited to put the Altra Lone Peak 4 through its paces, as Altras were a brand that I’d heard good things about but had yet to try myself. 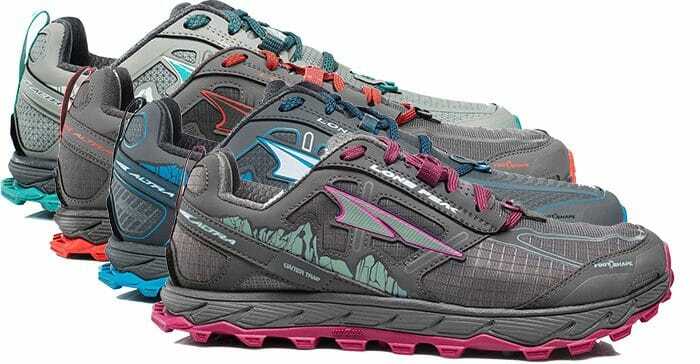 Altra are a US brand and it has been via my trips to California that I became aware of them and their popularity among trail runners and hikers alike. In fact, they are Altra’s most popular trail shoe and were the second most worn shoe among 2018 Western States 100 runners… so they must be doing something right! It is important to note that these are my first pair of Altra running shoes, so I can’t compare them to previous version. I see this as a positive, as I’m coming in fresh, with no prior knowledge of earlier models and no expectations from the Lone Peak 4.0. The first thing I noticed was the shape. They are not like a lot of traditional running shoes out there, owing to the wide forefoot shape. This is due to the Footshape™ Toe Box, which allows for a natural foot splay and for the big toe to remain in the correct position for maximum stability. To be honest, at first I was a little sceptical about how much difference this would actually make, but after several runs, I am completely sold… my feet didn’t feel achy or crampy post run, and my big toes have not developed ‘hot spots’ in the LPs, compared to running in other shoes, like my Salomon Speedcross 4, which are built quite narrow. Another important feature to mention is the drop. The Lone Peak 4s are a cushioned zero drop trail shoe, meaning that there is no difference in height from the heel to the toe. This suits me perfectly as I’m used to running around in 4mm shoes or sandals, but if you are used to something with a higher drop, it would be wise to transition slowly into these shoes. There are also hook and loop tabs to allow strapless gaiter attachment, perfect for those rapid scree descents! They don’t feel heavy despite looking a bit chunky, and fit true to size (I’m a UK 7). The women’s version of these shoes is designed specifically for the female foot, with a narrower heel and a higher instep. My first run in my Altra Lone Peaks happened to be on an unseasonably warm December afternoon, and the usually boggy Kilpatrick trails just north of Glasgow were dry, dusty and definitely ‘un-bog-like’! They performed very well straight from the box and I was very impressed with the grip and comfort, but I was looking forward to seeing how they coped with harsher conditions, maybe something a little more ‘Scottish’! A long run at a local windfarm in blizzard conditions was a sure-fire test, as I’m normally a bit cautious running on snowy, icy trails in case of a fall, but the grip of these shoes was fantastic! In fact, the only time I have slipped in them was descending a steep, grassy hill on a frosty morning, but that may be down to my technique rather than the shoes! I can’t recommend them enough, they are my new favourite trail shoe!